Of all the dropout recovery schools within the state of Ohio, Dohn has the highest number of student enrollments. 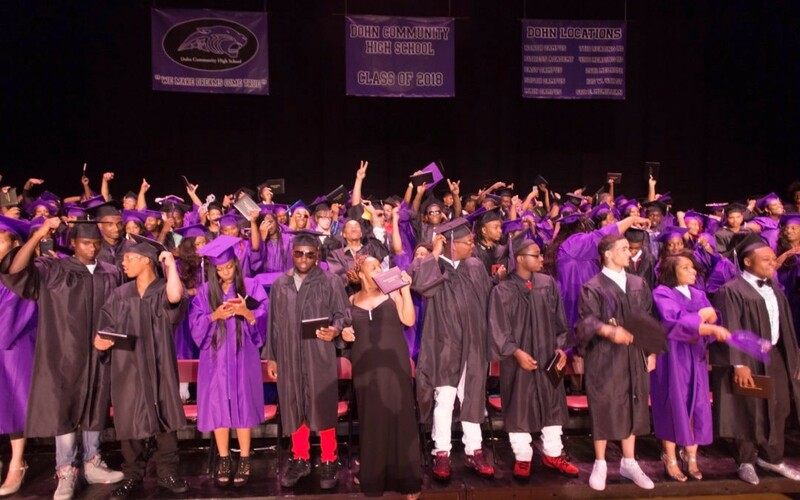 As enrollment grows, so do Dohn’s graduation rates. The 2018 Winter and Spring High School and 22+ Adult Education Graduations saw an unprecedented 469 students graduate. Dropout recovery students have daunting life challenges. Their learning needs were not met earlier in their education, and they dropped out. Whether due to the failure to read at grade level, or the fact that education takes a back seat because of poverty and urban violence or because of histories of generational joblessness and lack of regard for education, our students are challenged more than students from other area high schools. Richalyn King is pregnant, and her mom is incarcerated. In the face of these two challenges, Richalyn kept a focus on what she needed to do to graduate. Her teacher, Eric Randolph, helped with this. Every day for the month preceding graduation, Richalyn called upon her teacher for the kind of support a mother would provide in these circumstances. Richalyn graduated, and her plans post-graduation include relocation to Columbus for family support. Brooklyn Wood, 17 years old, started school in the fall and then soon dropped out. She has a young son, Quincy, born when Brooklyn was a sophomore. Her life circumstances were overwhelming, and she dropped out in the first semester. Brooklyn came back to school in January, with a focus to finish. She did finish, making up six credits, besides completing the four and a half credits for that semester. Determined and courageous, Brooklyn sees a future for herself. She loves math, and she has plans to start her own cleaning business, like her mother. She also plans on exploring a veterinarian career path. Tianna Mazion is a 16-year-old graduate. Coming from a supportive two-parent family, Mazion has a sister in the senior class who also graduated this year. Mazion shares that she lost her Uncle, a primary person of support in her life. This loss motivated Tianna to meet her own dreams of being an on-air radio personality. She is going to Central State to major in Broadcast Communication with a minor in business. Mazion says, “I was scheduled to graduate in May 2019. I put my mind to it so I could graduate a year early. I wouldn’t have that opportunity at a traditional school. Dohn Community made it possible for that to happen and live out my dreams early. I am very excited.” While most Dohn students who take advantage of our Credit Flex and Credit Recovery programs are trying to make up for lost credits, Tianna is setting the trend for students who want to accelerate the path to their future, and graduate ahead of the usual four-year schedule. Another student with remarkable fortitude is Sierra Beaty. At 18 years old, and with two children, Sierra works fulltime, and she managed to graduate this year, on schedule with her grade and age level. Hannah Washington delivered a captivating speech at graduation. Her speech runs from the time markers of 3:28-4:13 in the extended version of our graduation video. In the upper left hand, inset. In her own words, “I was 16 when I found out I was pregnant and my grandmother kicked me out of her house. I lived with my brother who had a one-bedroom apartment. I realized I wanted better for myself, so I went to Lighthouse Youth Services. I stayed there for four months until I eventually went into foster care. While in foster care, I had my son. I didn’t want to stay in the system nor be on welfare… again, I wanted better for both of us. My son was the best thing that ever happened and he motivates me to do better. “After graduation, Hannah’s next step is college, where she will explore a variety of career options for her bright future. Minyaiah Woods is another of our graduation speakers, and her speech can be seen at the time markers of 4:16-4:55. An exemplary student, Minyaiah is accepted into Central State College where she has been awarded the Freshman scholarship for 2018-2019 for academic excellence. In addition to this scholarship, Minyaiah completed her Free Application for Federal Student Aid, FAFSA, with the excellent result of having her college costs nearly covered. We wish we could tell every student’s story. Each one is compelling and unique and provides the motivation for Dohn to succeed as a school that Makes Dreams Come True.